MIA “Rossiya Segodnya” observer Vera Kostamo visited the Russian Arctic and prepared a series of reports about her trip. 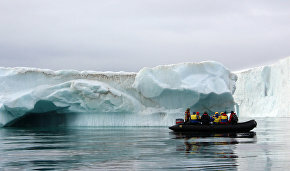 Arctic.ru has published the correspondent’s report on the peculiarities of Arctic tourism. — Veira, Veira! Bear! Get up! Bear! I heard somebody shouting in my dream. I must say, an icebreaker is the perfect place for a deep sleep, unless there's a storm, of course. Somebody in my dream is shouting something about bears. But suddenly it wasn't a dream. I jumped on the bed, looked out the open boat window and saw Joel waving his hands at me. — Veira, a bear! Everyone is taking photographs of this bear, and you? Joel Gonzalez is a musician from Cuba who has long become assimilated in Russia and settled in St. Petersburg. He is now travelling aboard the nuclear-powered ice-breaker 50 Let Pobedy to the North Pole. I try to estimate if I have time to get dressed, get my equipment ready and run from the stern to the foredeck before the bear disappears. The icebreaker is enormous — 30 meters wide and about 160 meters long. It resembles a multi-national residential building. During the summer you can hear almost any language on the ship — this is the season that the largest nuclear icebreaker takes tourists to the top of the world. Each tour to the Geographic North Pole involves a "hunt" for the first bear. Tourists and photographers stand on watch on the deck, armed with binoculars, waiting for their first bear. The tour operator even offers a bet on the date and time of the first sighting. All the photo "hunters" gather in the library, which is full of books on the Arctic. They sip coffee, look through their pictures and wait for another bear to be announced on the PA.
A female bear leads her maturing cubs away from the unfamiliar smells. Like any children, the cubs are different in character. One runs after his mom, the other keeps stopping and looking back at the strange "iceberg." Walrus rookery; nosy bears who can smell the eared seals coming to the ice-holes for air from a distance of one and half kilometers; whales with their fantastic breathing — water spouting from the surface. Guillemots resembling penguins, glaucous gulls, seagulls, birds, birds, birds. It's not a zoo, it's a natural habitat for these animals, and it's fascinating to see them in the wild. Some passengers stand on deck for hours, looking at the dark breaks in the ice running for many meters behind the ship in different directions. They see huge ice floes reluctantly turning over to demonstrate their turquoise underbellies. The water and the sky keep changing color. The Arctic is such a dynamic place that you have no time to soak it in and have to leave understanding and deep sentiment to savor later. Tours to the North Pole are often compared to space flight as Arctic landscapes look so unearthly and untouched. A person put in isolation cannot help changing and taking a fresh look at the life left behind on the mainland. Nobody expects this "re-formatting" when they purchase the tour, but it's all inclusive in the Arctic. It's possible to see the top of the world for $27,000-$40,000; depending on cabin class. 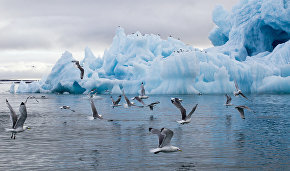 A tour from Murmansk to the North Pole with a stopover at Franz Josef Land lasts 11 days. The icebreaker accommodates 126 passengers in 64 cabins. Our tour, one of five in 2016, included people from 20 countries. They are mostly Chinese, but Russian tourists have been showing an increasing interest in the past few years. I met Zaur from Azerbaijan on the deck after travelling to Rudolf Island by boat. Zaur and his friends were carrying a heavy piece of ice. If you put it to your ear, you can hear a slight cracking sound. They gave it to the bartender; he laughed, accepted it and then pretended to be surprised. "I've visited about 50 countries and I realized after a while that they all seem similar, but the North Pole is something completely new, a distinct experience. The isolation is appealing; there is no communication here at all. It's interesting to just turn off your regular life mode. Few places could be so stunningly different after this trip to the Arctic.. So my next tour will have to be to outer space," Zaur said. There are various age groups among the tourists. In the summer, many families travel with children. The oldest passenger on the ship was 92. It's stormy today. Of course, the crew says this is hardly a storm but we take it seriously. It's a big effort to make it from our deck to the dining hall: the storm throws you from side to side. The strict dress code on the icebreaker makes sense: shoes with closed back, pants and no shorts — the clothes have to be comfortable for any situation you might find yourself in. The menu on the icebreaker is varied and lusty. The table and chairs are screwed to the floor in case of a storm. I can't eat. I have a seasickness pill in my pocket, and that will have to be my breakfast. It takes us five days to get from Murmansk to the North Pole, including the two day trip to Franz Josef Land. We can disembark on some of the 192 islands of the archipelago. 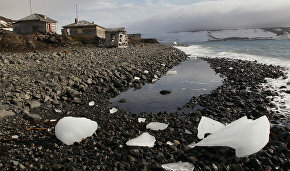 Tourists can walk along the coast escorted by rangers from the Russian Arctic National Park. They protect the tourists from polar bears and they also protect the Arctic from the tourists who are not allowed to take anything from the national park with them. The Arctic is full of surprises making it hard to plan — you can only assume. The weather is very changeable. A planned disembarkment on an island will be canceled if there is a bear in the area, or stronger wind or fog. If this happens, the tourists sadly take off their equipment and go to lectures. The Arctic teaches you to be patient and accept the idea that some things are not under people's control. A journey on this ship, when you are surrounded by ice alone, changes you, rids you of any unnecessary stuff. All pretense is left behind in the home of gadgets and the internet. "When you come out on the deck and look at the water and the ice floating into the horizon, you feel that this is what infinity is like," Joel says. "Music makes you feel similar. The world has its own rhythms. I try to catch the rhythm of the sea; I want to understand the rhythm of the Arctic. It can be anything here as the Arctic feels simultaneously eternal and volatile. Some people want to reach the North Pole to tick a box, I'm not saying that's a bad thing, simply that their values are different. I think the Arctic will motivate me to continue to improve myself. I'm grateful for every second I've spent here." 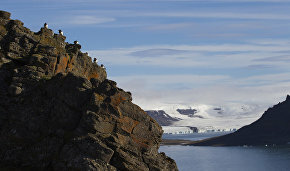 The tour package includes accommodation, food, equipment, helicopter and Zodiac boat trips, disembarking and taking walks on Franz Josef Land Archipelago, security provisions and lectures. Tourists can talk to the captain, stand on the deck bridge or visit the engine room. A team of experts hired by the tour expedition leader looks after the tourists. These experts speak several languages and are often skilled in several professions. "We are experts in the Arctic and Antarctic tourism," says Jan Bryde, an expedition leader for the Poseidon Expeditions tour operator. "The expedition business is a niche business. There are about 12 experts in polar tourism, we are not the oldest company, but we learn fast. We've been in the market for nearly 20 years. Our main difference is that our staff doesn't sit in an office, they all work "in the field." "I choose my team myself; I not only value professionalism but also character. We receive CVs from all over the world," he said. I walk down the gangway and step on the ice, 90 degrees north latitude — the Geographic North Pole. A Chinese woman is in front of me with an inflatable body ring; she plans to swim. The water in the Arctic Ocean is so ice-cold that it burns your skin. 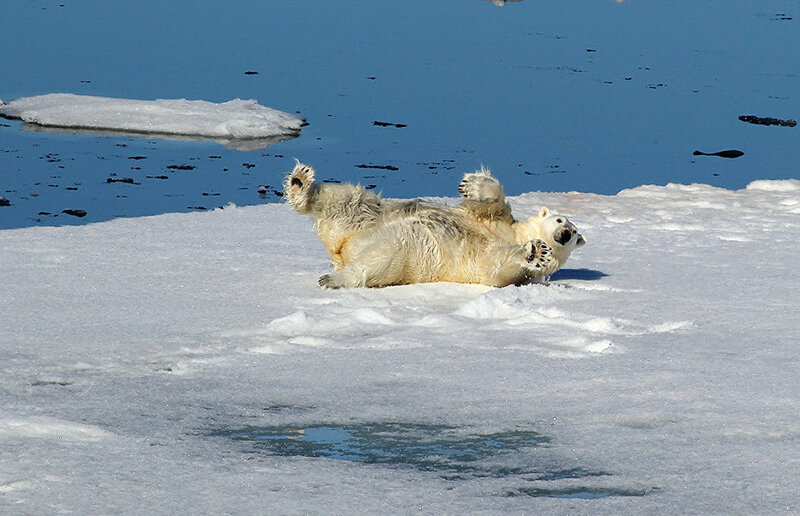 The temperature is only comfortable for seals and bears, but not so much for humans at minus 2 degrees Celsius. A group of swimmers has gathered around the ice-hole left by the icebreaker. They are trying to decide whether to jump straight in or immerse themselves gradually. I opt for gradually. I have to put on a safety belt, a doctor holding an emergency pack next to me gives me a comforting look. The ocean hugs me to the point of suffocation — it's hard to breathe in this temperature. The swim generally lasts less than a minute. Those who decided not to swim and the icebreaker crew are very patient and helpful. The crew takes a dip later after the tourists, which is customary. We have about six hours ahead of us at the North Pole. The tour program includes a circle of peace and a minute of silence. All passengers hold hands and listen to themselves and the Arctic.